On March 18 and 19, 2017, members of 38 Canadian Brigade Group Artillery Tactical Group (a Canadian Army (CA) Reserve Force unit) and 1st Battalion Royal Canadian Horse Artillery (a CA Regular Force unit) conducted collective training during Exercise FROZEN GUNNER at Canadian Forces Base Shilo in Manitoba, conducting coordinated Battery and Regimental fire missions and plans with the C3 105mm and M777 155mm Howitzers. Photo: Master Bombardier Lynn Danielson, 116th Independent Field Battery, Royal Canadian Artillery. ©2017 DND/MDN Canada. Shilo, Manitoba — I have been on several gun exercises throughout my career, but this was the first time I was going to see the “big guns” in action. 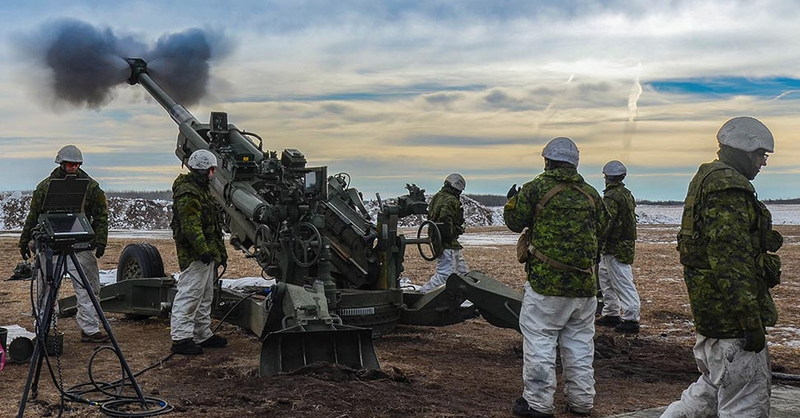 I was part of Exercise FROZEN GUNNER held at CFB Shilo on March 17 and 18, 2017 where 38 Canadian Brigade Group Artillery Tactical Group (38 ATG) and 1st Regiment Royal Canadian Horse Artillery (1 RCHA) conducted collective training to co-ordinate live battery and regimental fires. 38 ATG used the C3 105mm Howitzer, while 1 RCHA fired the M777 155mm Howitzer. Master Bombardier Zach McDermot-Fouts worked as a Reservist on the C3 Howitzer with 38 ATG before joining 1 RCHA, where he works with the M777. My head spins when I think of the amount of work which has to be done at the Observation Posts (OP) and the Command Posts (CP). “This type of joint training allows for a more technical shoot – a more advanced shoot – as well as the opportunity to engage in different missions that we would not have the option to engage in with just the 105s,” said Lieutenant Joyelle Norris, the 38 ATG Forward Observation Officer on the exercise. “We are very fortunate to be participating in this training with 1 RCHA,” said Major Paul Haughey, acting CO of 38 ATG.